By Jeff Aranow: Tom Loeffler says middleweight champion Gennady Golovkin and Saul Canelo Alvarez won’t be meeting for an HBO ‘Face Off’ or ‘Gloves are Off’ program before they face each other on September 15 in their rematch at the T-Mobile Arena in Las Vegas, Nevada. There’s a lot of bad blood between Canelo and Golovkin due to Alvarez’s positive tests for clenbuterol and due to him then pulling out of the May 5th rematch, leaving GGG to face Vanes Martirosyan instead. Canelo and Triple G do NOT want to see each other beyond the required press conferences and weigh-in. They have no choice but to take part in those meetings, as it’s part of the promotion for the fight. It’s not the smartest idea for GGG and Canelo not to try and promote their September 15th rematch on HBO pay-per-view as much as possible because they’ll make more money by increased PPV sales. Choosing not to participate in HBO’s Face Off with Max Kellerman and with the Gloves are Off will limit how many boxing fans will see the two fighters before they face each other in September. Loeffler says Golovkin is angry with the way the fight against Canelo was scored last September by two of the judges at the T-Mobile Arena. Loeffler says GGG feels he was wronged by at least two of the judges, and he wants to make sure that he doesn’t have that happen a second time when he faces Canelo in the rematch on HBO PPV. Canelo and GGG were supposed to have been ready for war in their previous fight, but it turn out that way. Canelo, 27, moved around the sides of the ring for most of the 12 rounds, while Golovkin stood on the outside throwing jabs. The fight was a disappointment to many boxing fans because neither fighter did what was expected of them. When Canelo would be stationary, Golovkin was still spending a lot of time on the outside. 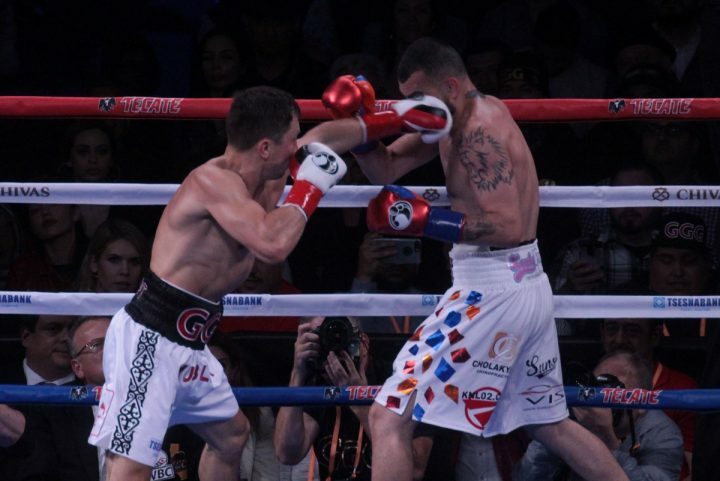 It wasn’t until later in the fight that Golovkin started going on the attack to connect with big shots. He still didn’t attack Canelo as much as he needed to for him to win the fight. Golovkin deserved the decision, but he failed to make it clear enough to get all three of the judges o give it to him. I think it was a combination of fear on Golovkin’s part and a bad game plan that prevented him from getting the ‘W’ last time. “I can’t go into details, but suffice it to say Triple G got what he was looking for or else he wouldn’t have agreed,” Loeffler said. There are all kinds of speculation about how much of a cut GGG got for his purse for the rematch. It’s believed by many boxing fans that Golden Boy offered Golovkin 42 ½ percent, and the MGM Grand made up for the last 3 1/2 percent to get Golovkin to the 45 percent threshold to give him the 55-45 split that he was asking for to agree to the rematch with Canelo (49-1-2, 34 KOs). Loeffler says Golovkin “stuck to his guns,” which is a huge hint that he ended up with the 45 percent split that he was asking for. GGG had previously agreed to a 65/35 split for the May 5th rematch with Canelo, but he changed his mind after Alvarez tested positive twice for the banned substance clenbuterol and then pulled out of the fight. There’s talk of a “hail Mary” move that the MGM Grand executives used to save the Canelo-GGG 2 fight. We don’t know what that move was, but the belief is that it involved ticket prices being increased for the fight to help bump up GGG’s purse to 45 percent. ”He feels that Canelo really needs him to rehabilitate his image,” Loeffler said. ”If Canelo had fought anyone else, it would have never rehabilitated his image. Canelo is now under strict VADA testing, and the only way Canelo can now rehabilitate his image is by fighting GGG. Now that Canelo has tested positive, it’s definitely a huge blow to his image and to his fan base and now the burden is on him to prove that he can fight at that same level as he did in the first fight now that he’s under the strict testing of VADA and to prove that there’s no illegal substances in his body. That’s the position that Triple G took. Canelo needs the fight with him to rehabilitate his image,” Loeffler said. Loeffler brings up a good point about Canelo needing the rematch with Golovkin to rehabilitate his image with the boxing world. With all the fans that believe that the Nevada State Athletic Commission assigned judges gave Canelo a gift draw that he didn’t deserve last time against GGG, it was important that he face him a second time to prove himself. Then there are the two positive tests for clenbuterol by Canelo. A lot of boxing fans question whether Canelo was assisted by clenbuterol last time he fought GGG. Canelo is going to be tested strictly by VADA leading up to his September 15th rematch with Golovkin, so whatever happens in the second fight, the fans will know that there was nothing fishy going on with Alvarez. ”Even if Canelo loses this fight, his image will be much better because his fan base will respect him for taking the fight and not going a different route by taking a much easier fight than Triple G,” Loeffler said. Canelo would have hurt his reputation if he’d fought someone else instead of GGG in his next fight. There’s nothing wrong with Canelo fighting Jermall Charlo or Daniel Jacobs, but with the controversy of the first Canelo-GGG fight and the positive tests for clenbuterol, it would have been bad for Alvarez to move on without fighting Golovkin a second time. Gennady had Canelo right where he wanted him when it came to the negotiations for the first fight. It was a double whammy that Canelo was dealing with in the negotiations with GGG. Not only had Canelo been given a controversial 12 round draw last time, but he’d also tested positive for a banned substance. ”Gennady thought it was unacceptable for the fight to be canceled under those circumstances,” Loeffler said about Canelo pulling out of the May 5th rematch because of two positive tests for clenbuterol.